Here models and student designers stand side by side during a fashion show at Hong Kong Polytechnic University. I’ll let you guess which ones are the models. Of course, the drastic contrast between female models and designers who look like ordinary people occurs at any fashion show, but here that difference is accentuated by ethic polarization. This post is not about the Olympics, except that this week everything is about the Olympics. Despite smug predictions in the Western press, the Chinese are pulling it off. The events are going smoothly, the bad news is not happening or quickly forgotten, and you have to admit that the place looks great. (I’d like to see a marathon course in any US city look half as nice as the one I saw Saturday night.) It looks like Beijing will achieve its objective–again. One result is likely to be a more widely held realization that China has become highly modernized. And so the question arises: On what terms are we likely to imagine Chinese assimilation into modernity? The photograph above provides the conventional idea: the West is obviously higher, more sophisticated, and literally the model to be imitated. Likewise, modernity is thoroughly raced: the ideal is Aryan, and one acquires all the benefits of modernization by forming oneself along those lines. If there happen to be obvious disadvantages, well, just be patient and they will be overcome in time–the shorter women in the photo are not going to get any taller, but their children could surpass them. And even though fashion is all about hybridity some of the time, here it is clear that the transmission of culture is entirely one-way. Even so, the image also contains another story as well. The Western women are there only to be draped and displayed, while the brain work is being done entirely by Asians. The West is a model, but passively so, and rendered passive by its own sophistication. If you had to pick three women to take to the moon, or the office, or the future, I don’t think there is any doubt which three should be given the job. This is a portrait of Li Shurui, a contemporary Chinese artist whom the New York Times says is “quietly emerging” as a talent within the male-dominated Chinese art world. Although the mask could double as a muzzle, there is nothing quiet about Li Shurui in this photograph. The story emphasizes gender equalization–currently, something featured as a sign of the West’s continued lead in the modernity Olympics–but Li is a study in conflated binaries: She is both male and female, Asian and Western, and organic and mechanical. As a cyborg she performs an important moment in modern feminism; with slanted eyes and blond hair she is actively hybrid, and her intensely focused look makes it damn clear that there is nothing passive about this woman. Most important, perhaps, is that she can represent an alternative model of Chinese modernization–one that includes key elements of Western society and culture without being mere imitation and gradualist assimilation toward a homogeneous ideal. This is likely to be the real China. Nor should anyone be surprised–it also is the likely to be the real West. Photographs by Alex Hofford/European Pressphoto Agency and Natalie Behring/New York Times. I think you’re quite correct from the perspective of race. But some media attention has appropriately criticized China’s totalitarian regime. The last thing I want to see is a repressive government successfully mask its inhumane policies with an Olympic PR coup. As for the models/designers I find the world of fashion so bizarre any of the six could be either or both. When looking at Li Shurui three things come to my mind. 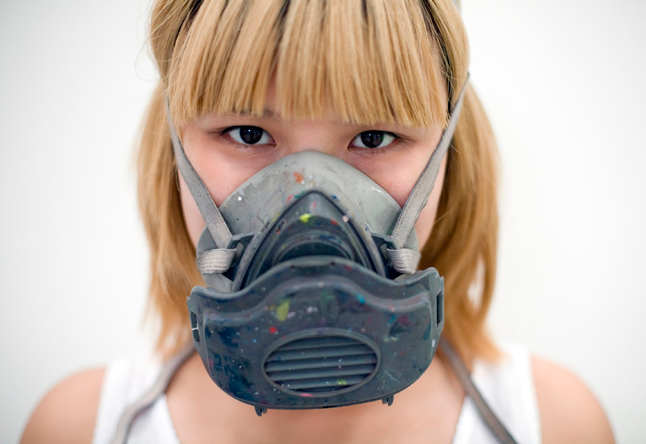 First, her mask is emblematic of the pollution that is so pervasive in Beijing. We need industrial strength filters just to breathe through the smog. Second, the splattered paint looks as if Li has just come out of a paint ball fight and yet the perfection of her face and hair suggest that the violence has been hidden or disguised. In much the same way the violence of China has been hidden or disguised by the over-the-top beauty of the current Games. Third, the blonde oriental leads me to think that there is something unnatural and forced in the homogenizing of global culture. As in cuisine some fusion food is fine, but on the whole I prefer regional food. It lets me know when I have traveled too far or for too long and it lets me know when I have returned home. I have to beg to differ with Rob, who posted above. The bricolage in Li Shurui would more indicate an -intentionality- than something “unnatural and forced.” Clearly the artist is consciously manipulating the symbols, but I see no lack of cohesion. I’m not sure I grant that I’d consider Li Shurui ‘cyborg’ in this picture, but I may be oversensitive. What I do see is that Shurui -is- performing something along the same lines as cyborg artists (like Orlan): she is taking recognizable icons and combining them into a specifically chosen identity. Blond hair, slanted eyes, an aggressive (masculine) glare, the mask– the symbols seem conflicting. But as the article says, this is acquisition without assimilation. Li Shurui isn’t trying to be Western, she’s using the space between cultural norms to play with how she presents her identity. As with most things visual, it’s largely a matter of whether or not the image is believable, and since the topic of this post was fashion, I’ll put it this way: She’s pulling. It. Off. this is a great piece of observation and writing, thanks for doing it. Nice post,I have Digged this site for future and will keep a eye on your other posts.